Rainbow Fruit Parfaits and the Lego 2 Movie! I partnered with Warner Bros. Pictures to bring you this yummy dessert idea that kids will love to make and eat! Kids love rainbow fruit parfaits! So easy to make — layers of yogurt and fruit are the perfect way to start off or end the day! We loved The LEGO Movie! It was a smart and funny movie that was fun to watch for kids AND adults! Chris Pratt and Will Arnett are back in The LEGO® Movie 2: The Second Part! In theaters February 8! The LEGO® Movie 2: The Second Part,” reunites our favorite LEGO characters of Bricksburg in an all new action-packed adventure to save their city. It’s set five years after the first movie ended, and now the LEGO citizens are facing a huge new threat: LEGO DUPLO® invaders from outer space, who are wrecking everything faster than it can be rebuilt. The battle to defeat the invaders and restore harmony to the LEGO universe will take Emmet (Chris Pratt), Lucy (Elizabeth Banks), Batman (Will Arnett) and their friends to faraway, unexplored worlds, including a strange galaxy where everything is a musical! The LEGO Move 2 comes out February 8th and we can’t wait to see it! In The LEGO Movie 2: The Second Part, the beloved characters go into space and have some amazing adventures. They meet Queen Watevra Wa’Nabi – who has the ability to transform herself into absolutely anything she wants – from a colorful horse to a pile of bricks with a crown and incredibly expressive eyes! From the previews of the movie, we thought the queen seems so funny that we decided to make a dessert based on her character — Queen Watevra Wa’Nabi Rainbow Fruit Parfaits! Yogurt, with layers of fruit that correspond with the colors in the shapes that Queen Watevra Wa’Nabi transforms herself. We even made some toppers in case you want to make some layered fruit parfaits!! They are yummy AND healthy. Plus your kids will love making them as much as they will love eating them!! 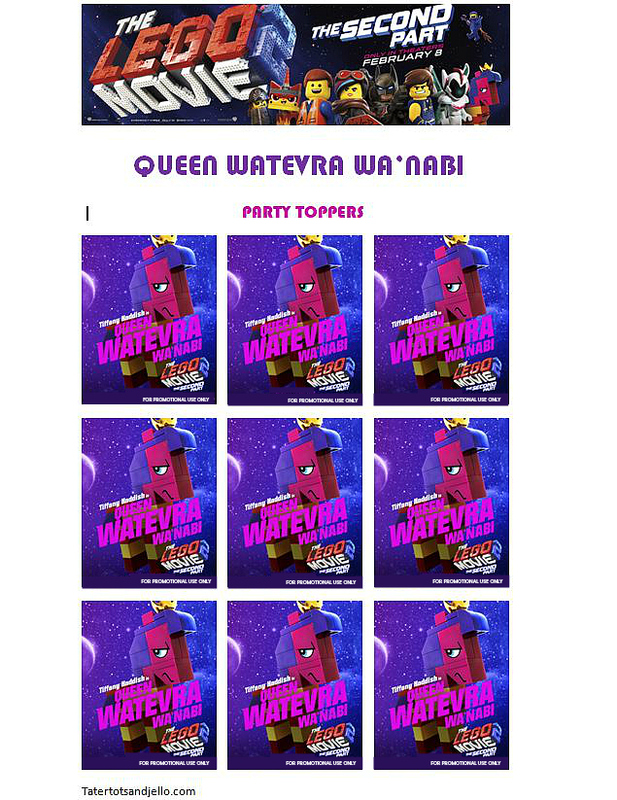 And be sure to check out the new LEGO Movie 2 and see how cool Queen Watevra Wa’Nabi is!! Layer the other fruits — pineapple, mandarin oranges, strawberries, raspberries, blackberries and either greek yogurt or whipped cream. Sprinkles are optional. Add these cute Queen Watevra Wa’Nabi printable topper and surprise your kids with these Layered Fruit Parfaits and then check out the new LEGO Movie 2 — it’s in theaters February 8th. We can’t wait!! See you at the movie! Kid-Friendly Recipe: Holiday Blossom Cookies! Kid-Friendly Recipe: Peppermint Sugar Cookie Bark! New Holiday Appetizer — Southern-Style Cornbread Crostinis with Topping Bar! 5-Minute Mac + Cheese in Your Instant Pot! Yes! We are super excited to see it too!